Communities That Care® is committed to making Tooele an environment that is “raising healthy, successful, and considerate youth.” We also believe in building a healthy community one family at a time! For several decades, people have put a lot of time and energy into efforts that promote healthy and positive development of youth and families. Most of these efforts have been done with the best of intentions, but with a lot of guess work. For over 30 years, there has been extensive research in the field of Prevention Science—showing what works and what doesn’t in our efforts to support healthy development of children. Tooele City was very fortunate to be among the first communities in the nation to use this research. 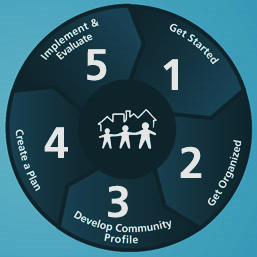 In 2003, we were able to pilot the Communities That Care Operating System; a customizable framework for prevention out of the Social Development Research Group at the University of Washington. This framework includes a coalition-based community prevention operating system that uses a public health approach to prevent youth problem behaviors including underage drinking, tobacco use, violence, delinquency, school dropout, substance abuse, and suicidality. Today, Tooele City is proud to support and fund one of the longest-running Communities That Care operating systems in the nation. We continue to collaborate with local agencies, businesses, schools, and parents in providing the best prevention practices, strategies and programming available.